CD / 12″, two tracks. Released here in the United Kingdom as a dance 12″ (white label), this recording has appeared in numerous dance charts (Melody Maker, Mix Mag, Fat Cat…) and has become a club hit. Unnamed stars contribute to this Hafler Trio mix, recorded in Reykjavik, Iceland. 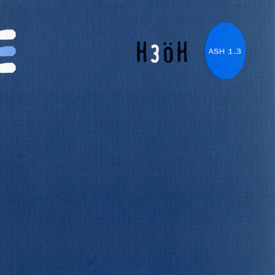 Side b contains a rare example of Andrew Mckenzie of The Hafler Trio (H3O) on vocals. “Got a bit of a problem. I got hold of this record, possibly a promo, by a bunch called H3ÖH. It sounds something along the lines of tribal ambience, if its possible. There’s lots of flutey sounds, analogue bubbling, and low (african?) chanting, as well as the normal sort of ambient type samples and sounds. The thing is, who are they? There are two tracks on the 40-min long 12″, and I wouldn’t mind finding out the track names. Some of the sounds are very Zoviet-France (Newcastle band affiliated with UK industrial scene, but not very industrial, more eastern sounding than western) and it makes me think its them under a different name. Who knows? Any help would be appreciated: upcoming releases, label, names, anything.